Recently I purchased an inexpensive lot of MUSCLEMANIA figures. The lot contained a Dark Blue #2 that I needed. Plus it gave me the opportunity to update the picture in the visual archive. It was the first time in a very long, long time that I had actually thought about my MUSCLEMANIA collection. I was looking at the site and my collection and was hit with a theory. 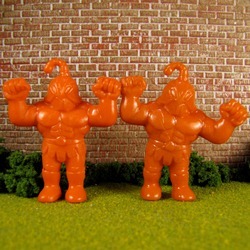 Figures #1-12 were released in 4-packs before M.U.S.C.L.E. figures. This is the “1984” 1st wave release. These figures were cast in the Firm rubber, in six colors (Dark Blue, Light Blue, Yellow, Red, Green, and Translucent Green). 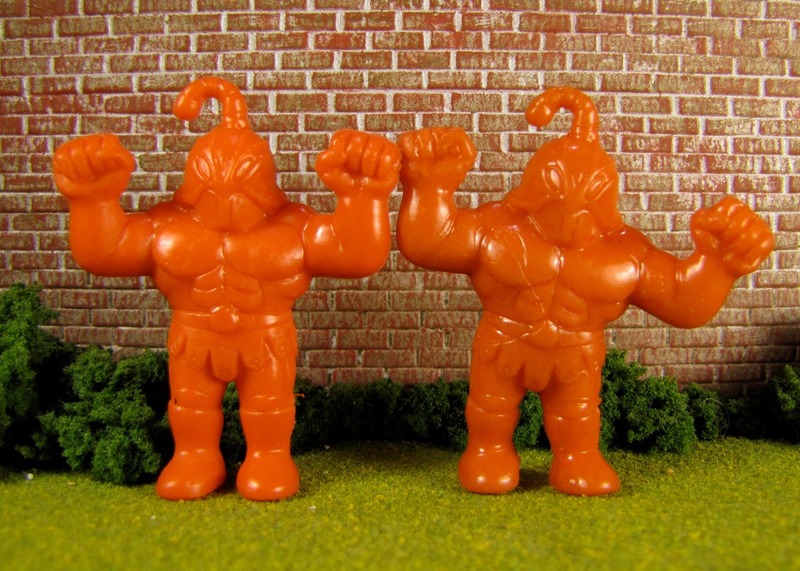 MUSCLEMANIA is largely unpopular, and M.U.S.C.L.E. is released – becoming a smash hit. Select, to better capitalize on the success of M.U.S.C.L.E. toys, re-tools to include a 12-pack and 12 new figures. 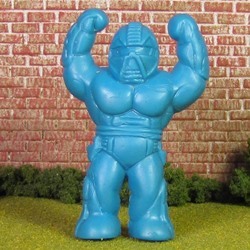 Select adds a seventh M.U.S.C.L.E.-like “Flesh” to their list of colors. To have a competitive price point with M.U.S.C.L.E. toys there must be a cost reduction. Select changes to a lower cost manufacturer and a lower cost figure material. Here is the final, wildest, and most longwinded thought. For a possible variety of unknown reasons, the first manufacturer kept the original molds. This is why the Stretchy figures are slightly smaller. Select believes a new SKU (the 12-pack) may sell better to retailers that did not see success with the original SKU (the 4-pack). Given the success of M.U.S.C.L.E. retailers are willing to take a greater chance on weird, little, wrestling, monster figures – especially if it is a lower cost option. I believe this period focuses on the #13-24 figures. This is the “1985” 2nd wave release. For the “1986” 3rd wave release Select essentially purges their final inventory. All the figures are cast in the remaining inventory and/or the lowest cost option – likely primary colors; not the “Flesh” color. This is why we never see Figure #1-12 in the “Flesh” color. Then the line is dead. This is why I think a Master Set is impossible for MUSCLEMANIA. What do you think? More importantly, does anyone have a Firm, Flesh version of any of Figures #1-12? As a small endnote, I believe this theory supports the idea that Army Man Plastic figures are counterfeit figures. This entry was posted on Thursday, October 15th, 2015 and is filed under Anthropology, Research, UofM News. You can follow any responses to this entry through RSS 2.0. You can skip to the end and leave a response. Pinging is currently not allowed. This was my theory as well, though I didn’t take it as far as you with exploring and suggesting marketing and manufacturing tactics by Select. That being said, I think you are on to something. There is no question that Musclemania came first in the American market in my mind. 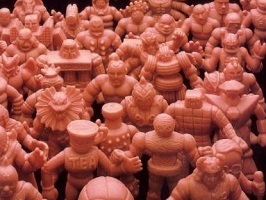 I think they were based off of kinkeshi, and some of the early molds suggest that as well. There are a few factors I feel we will never see, one being flesh versions of 1-12, another being translucent green or firmer versions of 13-24. I also don’t expect to ever see yellow or light blue versions of 13-24, and I honestly feel that any examples posted up of these in light blue are just lighting or manufacturing one offs. Just my opinion though. The hard plastic are most certainly bootlegs too! Agree with you 100% on everything Chris. I was trying to come up with a Master Set number and I was left with the same thoughts. I think you’re also on to something with the #1-12 Light Blue/Dark Blue situation. Until this most recent Dark Blue #2 I have never had a Bark Blue #1-12 come into my collection. Pretty strange. We can’t say for sure 1-12 was never in flesh because of this guy here!